This was a rapid design project based on the product strategy created by the client. We began sketching right away and created a design concept which we tested with users multiple times. We tested concepts with users by creating a quick wireframe Flash prototype. We learned a lot and were able to iterate the conceptual model and the interaction model before moving into the visual design. Once the app was in Beta, we participated in testing with intercepts using Ethnio from Bolt Peters. The goal of the new app was to be able to make a book in 30 minutes or an evening. The first book made came in at 28 minutes. More than that, the conversion rate for the new app was double that of the desktop app meaning that users were twice as likely to complete a book they started. This new Blurb product is aimed at casual bookmakers who might want to make a book in an hour or an evening. The new online application is a complement to the existing Blurb desktop app that requires more of a time commitment. 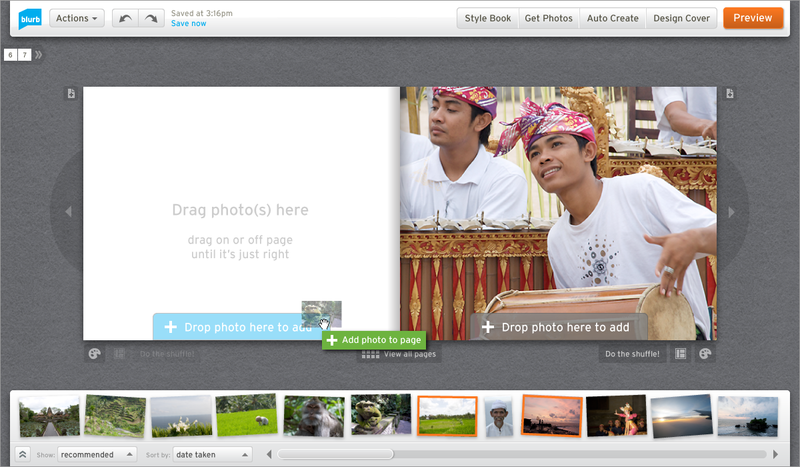 The app was built in Flex and uses direct manipulation to mimic how a user might layout out photos in an album. The user drags photos to a page to create automatic layouts or have the application layout the entire book for them. I was the lead User Experience Designer on a design team of three from 01/2010 – 06/2010.